That’s it until 2024! Town Hall closed for repairs. In the meantime you’ll be able to buy Ed Glinert’s wonderful new book, “Manchester Town Hall: The First 140 Glorious Years”, soon. 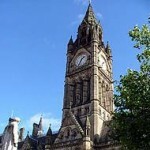 Manchester Town Hall is the crowning glory of the world’s greatest industrial city, a Gothic Gormenghast of stone statues, soaring spires and religious symbolism crowned with the famous Ford Madox Brown murals. Our tour takes in everything – the architecture, the portraits, the pictures, the politics, the Order of the Garter crest, the strange animal that guards the entrance, the legend about the Nazis’ love of the building…right up to the thankfully abandoned plans to demolish it. Our guides are brilliantly informed, wonderfully entertaining and great fun to listen to. We constantly discover new things and unearth unusual angles about the building. We do more than just point out the bleedin’ obvious; we reveal, unveil, cross-reference. We talk about the sacrilegious placing of a cotton boll on top of the church-like tower; the masonic symbolism to show the “true time” on the clock; the coup within the Labour Party that abolished the post of Lord Mayor. For a fully detailed, definitive, de-luxe Manchester Town Hall tour, this is the only option. Please read to the end for a full and frank preview! The tour has been devised by Ed Glinert, author of “The Manchester Compendium”, and no one knows the building better than Glinert, the only Manchester tour guide who has been there during all the great Town Hall events of the last 35 years…from the palace coup of 1984, when the position of Lord Mayor was abolished, to the carving of some of the last Freeman of Manchester awards on the council chamber wall. 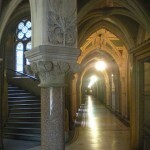 If you want to understand Manchester Town Hall, be guided around by New Manchester Walks. Yes, this is the de-luxe tour. It’s wonderful when a customer sends an e-mail with the above praise. And that’s exactly what happened after Sue Grimditch’s Town Hall tour. “Good Morning. Just letting you know how much I enjoyed the Town Hall Tour yesterday with Sue. It was fabulous – a wonderful experience. Sue was professional, friendly and entertaining – she made the Town Hall come to life and her knowledge was endless. She went beyond what I expected and I can’t wait to go on another one. I have wanted to look round the Town Hall for years but didn’t know there was a guided tour and I couldn’t have wished for a better guide than Sue. Everyone on the tour was impressed with her knowledge, not only of the Town Hall, but the historic, architectural and political history of Manchester – it was worth every penny. Ed Glinert, author of Penguin’s Manchester Compendium and editor of Penguin Classics’ Sherlock Holmes stories, sums up the essence of the building and its history. 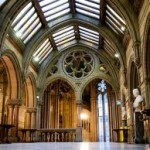 Fittingly for a city that prides itself as a municipal power on a scale rivalling the great city-states in European history, Manchester Town Hall is the grandest, greatest and most imposing building in the region. It was built from 1868-77 to the Gothic designs of Alfred Waterhouse whose plan, one of 136 entries, while not the most handsome and not even the winning entry initially, was the one the judges felt made the best use of light, ventilation and the awkward triangular site available. The Corporation had given no preference for the building’s architectural style, but to emphasise Manchester’s newly found wealth from textiles Waterhouse chose as his model the 13th century Gothic cloth halls of Flanders. He built in brick faced with stone from the West Yorkshire Spinkwell quarries for the exterior, ashlar for the interior, and placed above the main entrance a 386-foot high clock tower. He also included much statuary on the façade. General Agricola, the Roman who founded Manchester in AD 79, is honoured with a statue over the main doorway. Above him are Henry III and Elizabeth I, and there are also statues of Thomas de la Warre, founder of what is now the Cathedral, and Humphrey Chetham who founded what is now Europe’s oldest library a mile away. Inside the ground floor entrance are busts of the scientists John Dalton, with glassware at his feet, and James Prescott Joule, cross-legged, leaning on an elbow. Inside the building Waterhouse’s skill becomes apparent. Seven staircases lead up from the ground floor; some grand and imposing, others spiralling mysteriously at the corners of the building. On the first floor are the Lord Mayor’s rooms, the Conference Hall, which contains the original council chamber and contains a huge Gothic chimney-piece, oak screen and wrought-iron galleries where the press and public sat, and the Great Hall, the building’s tour de force, which John Ruskin called “the most truly magnificent Gothic apartment in Europe”. In the panels of the Great Hall’s hammerbeam roof are gilded costs of arms of the nations with which Manchester traded, and on the walls are Ford Madox Brown’s 12 murals which illustrate episodes in Manchester’s history. The internal courtyard in the basement is often used as a Victorian setting in TV dramas, while throughout the profusion of cloister-like corridors, spiral staircases, bridges and stairwells creates a wonderful sense of drama. The Town Hall was officially opened on 13 September 1877 with a grand ceremony marred only by the refusal of Queen Victoria to attend. Benjamin Disraeli, the prime minister had to notify the city cryptically that it was “out of the power of Her Majesty to be present on this interesting occasion”. The reasons, undisclosed at the time, were that the Queen was unhappy that the Manchester Corporation had commissioned a statue of the regicide Oliver Cromwell. She was also wary of being seen on the same platform as the one time fiercely radical Manchester mayor, Abel Heywood, who had once been imprisoned for distributing publications which argued for abolishing the monarchy. Such was Manchester’s penchant for empire building, by the 1920s it considered the Town Hall too small. E. Vincent Harris was duly commissioned to build an extension on an adjacent site to the south, and it is there that the council now meets. Yet ironically when the Corporation commissioned chief surveyor Rowland Nicholas to draw up the Manchester Plan of 1945 in rebuilding the city after the Second World War, he decided the main Town Hall was now too big, and suggested it be replaced at excessive cost with a streamlined modernist replacement. Fortunately for Manchester his proposals were shelved.